Designed for the modern home, Perludi‘s AMBERintheSKY foldable loft bed helps conserve space, leaving plenty of room for both rest and play. To create AMBERintheSKY, Perludi stretches a durable loden fabric covering over a sustainable birch plywood frame, which gives the entire piece a unique look and playful feel. The loft’s short stature (135 cm tall) makes it perfect for rooms with low ceilings, and reduces the chance of serious injury if your little one should tumble out of bed. The AMBERintheSky loft is exceptionally stable and free of glue or dowels due to its loden structure. Loden is a heavy, wear-resistant fleece fabric made from wool and it acts as a joining element. Choices of loden color for AMBERintheSKY include brown, green, orange, and gray. 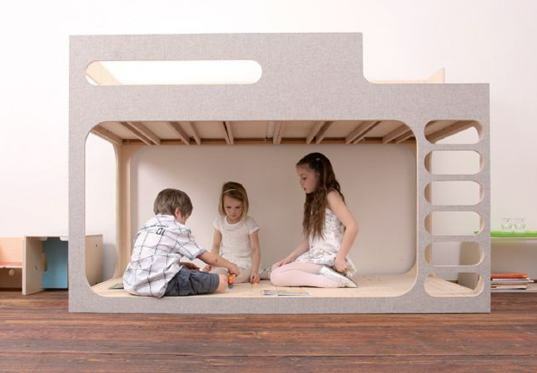 The packaging for the loft bed, and the bed itself are 100% recyclable. Any cons? The gorgeous and sustainably designed AMBERintheSKY loft bed comes with a steep price tag — but for those living in a small stylish spaces with more than one child, the cost may be well worth it. l love this bed! Where can you find it in the United States? Its a lovely bed. Very creative. can you use the bottom part of this bed to sleep with a matteress? Designed for the modern home, Perludi's AMBERintheSKY foldable loft bed helps conserve space, leaving plenty of room for both rest and play. To create AMBERintheSKY, Perludi stretches a durable loden fabric covering over a sustainable birch plywood frame, which gives the entire piece a unique look and playful feel. The loft's short stature (135 cm tall) makes it perfect for rooms with low ceilings, and reduces the chance of serious injury if your little one should tumble out of bed.